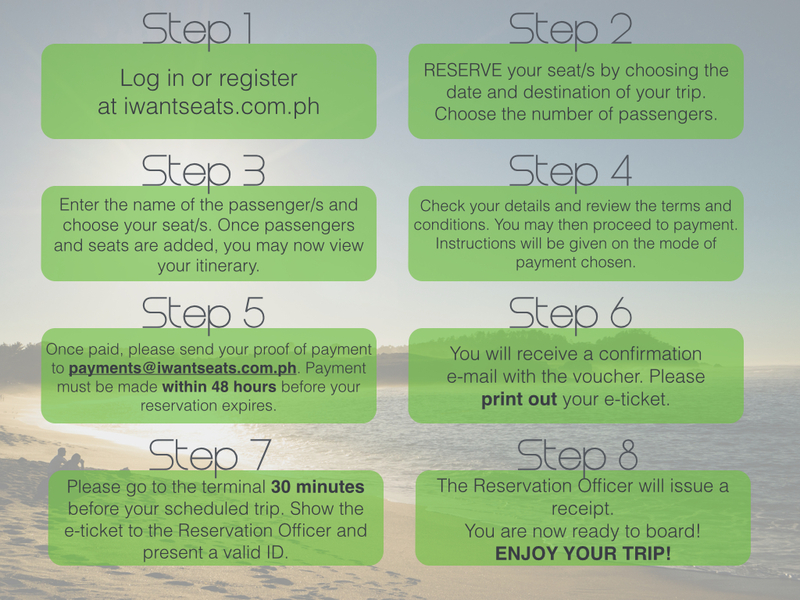 IWantSeats (“Company”) shall serve as an online booking facility for bus operators (“Operator/s”) listed in its website, IWantSeats.com.ph (“Website”). The Company’s sole responsibility to the Operator shall be to provide an online medium to facilitate the sale of a bus ticket to a prospective passenger, which will be treated as the Company’s customer (“Customer”), through online booking. The Company shall not be considered an agent of the Operator as a common carrier nor shall it share in the obligations and liabilities of the Operator as a common carrier. The Company shall not be included as a party to the contract of carriage between Operator and Customer. The Company shall provide and maintain an online booking facility to assist a Customer who wants to book a bus ticket online. Its obligations shall be limited to its role as an online booking facility and shall not be liable to the Customer as a common carrier or an agent of the common carrier. “Company” means IWantSeats, Inc. which shall serve as an online booking facility servicing bus operators. “Operator” means a bus operator or company which shall provide the transportation service to its passengers. “Customer” means a prospective passenger who wishes to book a bus ticket via the online booking facility. “Website” means IWantSeats.com where the online booking transaction shall be done. “eTicket Itinerary” means the electronic document confirming the reservation after verifying receipt of payment and containing details of the scheduled trip and personal information of the passenger. “Confirmed Reservation” means a reservation for which full payment has been made by the Customer and constitutes a completed transaction. The Company shall reflect the schedule of fares and fees which it warrants as true and correct as of the time of publication. For facilitating the online booking of tickets, the Company shall collect a ticketing convenience fee of Php30, inclusive of VAT, per passenger. This fee is on top of the regular fare and fees charged by the Operator. The ticketing convenience fee shall be non-refundable in any event whatsoever. Upon confirmation of the booking, an eTicket Itinerary shall be sent the Customer. The Customer shall shoulder any government taxes, charges or insurance surcharge imposed by the Government or terminal operator for use of services or facilities, in addition to fares, fees, and charges imposed by the Company and the Operator. Such government taxes, charges or insurance surcharge may be changed from time to time, even after the confirmation of the booking, but shall still be borne by the Customer before departure. The Customer shall pay the reservations made on the Website via Gcash or Bank Deposit. Full payment shall be made before the expiration of the reservation period indicated on the booking and confirmation page. Unpaid reservations shall be cancelled automatically by the system. Upon validation of the full payment made by the Customer, the Company shall confirm the reservation. An eTicket Itinerary shall be sent to the contact details provided by the Customer. The Company shall not be responsible for any refund, rebooking, or cancellation of bookings. The Customer shall course any request for refund, rebooking or cancellation directly with the Operator and shall be subject to the Operator’s rules and regulations. The Customer shall be required to check-in at the terminal at the point of departure, 30 (thirty) minutes before the scheduled time of departure. If the Customer fails to show up at the terminal within the given time, the Operator shall have the right to forfeit the reservation and give the Customer’s slot to walk-in customers. The Customer shall be required to present: (1) a printed e-Ticket Itinerary; and (2) a valid ID. The Operator shall not honor any reservation absent any of these documents. In case of violation of these embarkation deadlines, the Customer and the Operator may agree to a refund, rebooking, or forfeiture, subject to the Operator’s rules and regulations. Any other damage or prejudice caused to the Customer by the Operator, its employees, or third persons. in the payment of the booked reservation coursed through payment channels, such as account number, account information, reservation number, and other relevant information.